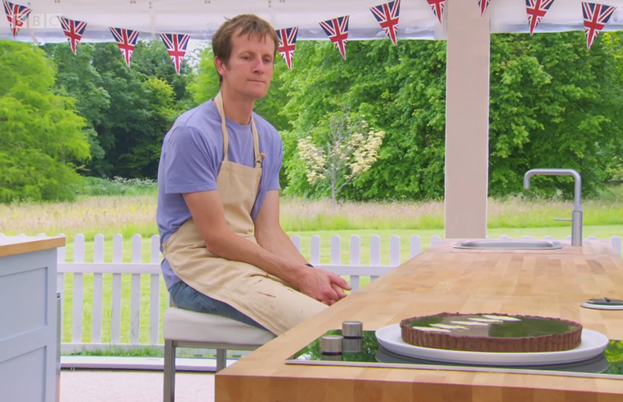 Bake Off favourite Howard Middleton takes us through Chocolate Week of the current series, where the four remaining bakers battled it out for a place in the final. From staggered soufflés to crumbling carousels, read on to discover who kept their temper and who got their tuiles in a twist. What’s the collective noun for chocolate? A richness, a cluster… a migraine? Whatever it is, there’s no shortage tonight, as the semi-final devotes itself to this beloved ingredient. Our quirky quartet looks a nervous bunch. Having endured the challenges of eight weeks, this is the one with a potential pass to the final. You can feel the fear. 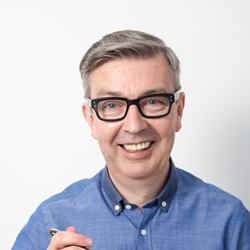 Now, I think series six has been comparatively prescriptive, often leaving limited room for creativity, and this week’s signature bake is no exception. It must be a chocolate tart, with chocolate pastry and a chocolate filling. Mary is relishing the challenge with the seasoned sneer of a Bond villain. She says she expects ‘impeccable’ and ‘brilliant’. Fortunately, to the huge relief of our semi-finalists, she doesn’t expect anyone to die. Paul disagrees - any mistake will be fatal. Tamal cuts through the richness of this death by chocolate with a layer of raspberry coulis and adds crunch with pecan praline. Paul reminds me of my late great Uncle Walt, who frequently had to ask his wife, “Do I like this, Olive?” He ponders ponderously if he approves of Tamal’s offering then decides he does. Ian is infusing his salted caramel with bay leaves. Neither Mary nor Paul looks convinced by this foliate contribution and plant him in the danger zone. 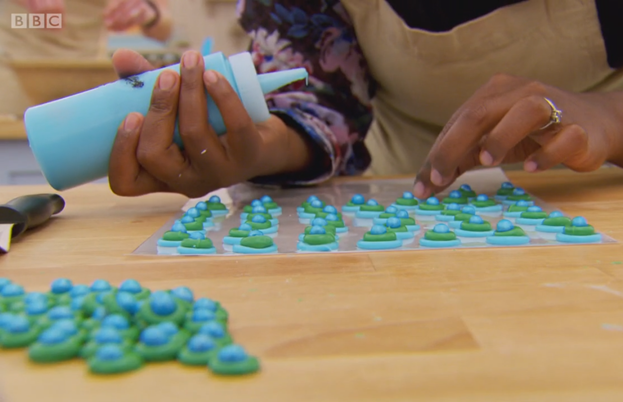 Nadiya is also salting up her caramel, adding peanut butter, and truffles rolled in peanut dust. Mary reveals she’s not a peanut fan. She’s probably not a dust fan either. Then she tastes it… and smiles, the sun comes out, bluebirds take flight and all’s right with the world. We know this is one very classy tart when Paul bestows another Hollywood Handshake. Flora has surely learnt her lesson by now and will not be overstretching herself today. Think again. She layers passion fruit custard with chocolate mousse, then makes amber macarons, cubes of passion fruit jelly and tempered chocolate arcs. It looks splendid but her custard has split and Paul chokes on her ‘bone-dry’ macarons. For the technical challenge, it’s chocolate soufflés. The bakers are staggered. No, literally - to get the timing right, the bakers are set off at different times. It’s relay revolutionary. We’ve not seen such mixing up of an established format since Big Brother switched to Channel 5 and Jeremy nabbed the job of party leader. A perplexed Ian can’t remember how to make crème patissiere. Nadiya reveals what she describes as her Jekyll and Hyde persona and decides she’d rather be giving birth. With a hint of ironic foresight, Tamal points out that he’s the last one to come in to the tent. As he’s disclosed publicly this week, he’s also the first one to come out. I give a little cheer. Soufflé-like – the romantic hopes of a thousand women sink, and a huddle of men with high expectations rise to the occasion and iron a clean shirt. 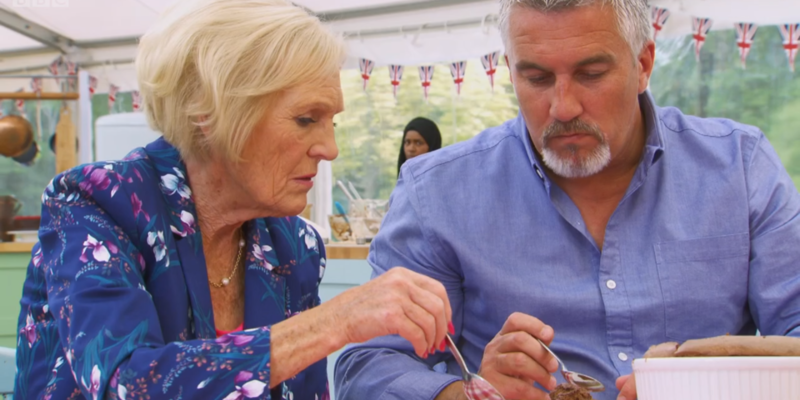 This week’s judging consists of Paul and Mary sitting with their backs to the bakers. The bakes are presented in turn, like soufflé speed dating. 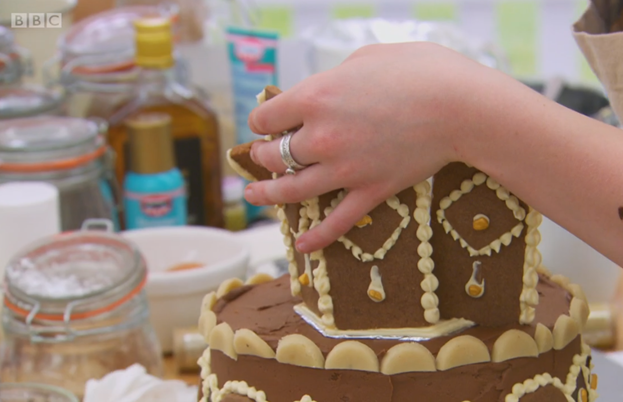 They decide that Nadiya’s visible lumps of meringue put her fourth but Flora’s well-mixed dome rises to the top. 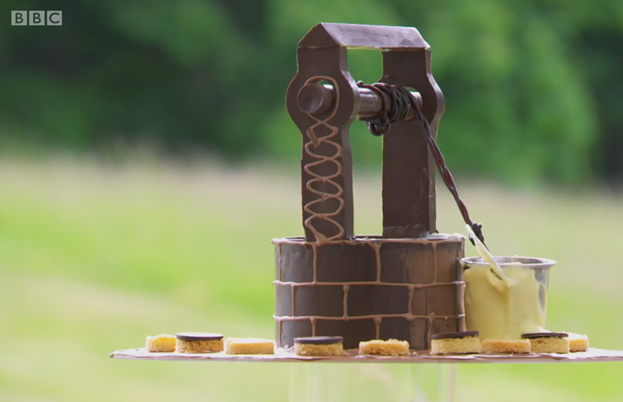 Chocks away for the showstopper – the vaguely entitled ‘chocolate centrepiece’. If, like me, you’re not sure what this means, it’s clarified as an impressive construction that must include biscuit and white chocolate. McVities Deli Chocs just won’t stack up. Flora is making a chocolate carousel. Paul’s not impressed that she’s cutting out horse-shaped biscuits with a biscuit cutter. Renaissance woman Flora reveals that she hand-made the cutter herself. Paul’s not impressed with the cutter. Undeterred, Flora says she’s going to ‘poosh and poosh and poosh’ to the end. Nadiya still favours the childbirth option. Nadiya crafts a chocolate peacock, decorated with what Mel calls ‘drah jhay’. I feel very common. I’ve always called them dragees – like a drag queen tribute to Debbie McGee. Tamal is revisiting his recipe from biscuit week and making star anise biscuits again, this time in the shape of a bell tower. It looks superb, but it’s not ringing Mary’s bell. Her verdict? “Impressive walking into the tent, but not close up”. Crumbs! But Mary’s most alarming assessment is directed at Ian. His working chocolate well includes a little tin bucket that draws sauce from a Perspex tube. Apparently Mary’s never had lemon in chocolate before. Well, you know those lemon cream stragglers in almost every box of chocs since the dawn of time? Expect to see them rebranded as ‘Mary’s Citrus Surprise’. 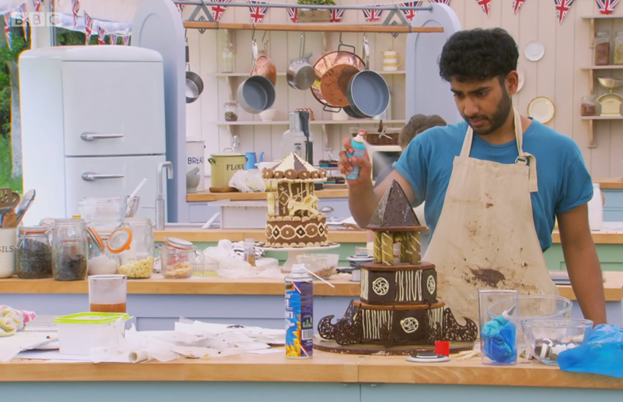 As we consider who will shine brightest in our galaxy of chocolate stars, Mary and Paul spoil things slightly by revealing that Tamal and Nadiya are safe and it’s between Ian and Flora to go. Nadiya’s poor showing in the technical is outweighed by brilliant performances in the other two challenges and she gets this week’s bounty. Flora, who always tried to go the extra mile in the tent, is sadly sent 387miles north of it. 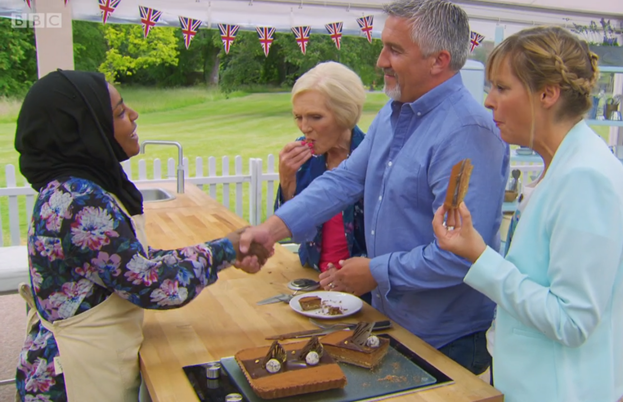 And so we have our final three – Tamal, Ian and Nadiya. The winner could be any one of them. Well, technically it can’t, as the winner can only be the one who actually won, but let’s hope confidentiality agreements hold up for another week. Any chance that we’ll miss it? I should cocoa.